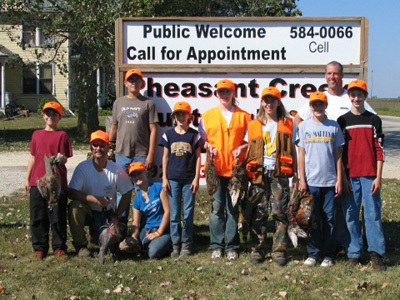 Pheasant Creek Hunt Club became a reality through the hard work of a farm family in central Wisconsin. Jim and Charlotte Fiegel, along with their children Jennifer, Sara, Brenda and Brian, wanted to provide a relaxing break from the everyday grind. The family farm land seemed the ideal location for hunting, recreation, or simple relaxation; with a wide variety of hills, plains, woodland, and grain sorghum the idea of a wildlife hunting area was born. The farmland has been in the family for four generations and has to be seen for one to realize its true beauty and potential. At the present time, the land is used for three purposes; the main farm area is utilized by Brian Fiegel for managing dairy cattle, much of the land is devoted to crops, and the remaining land has been selected especially for the purpose of providing a natural yet challenging hunt.